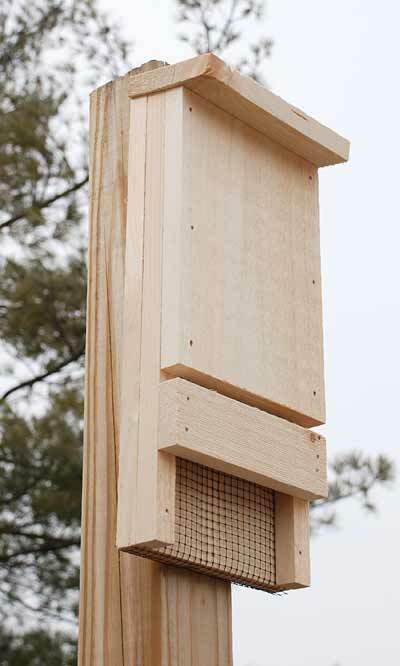 Create a bat haven in your yard with the Coveside Mini Bat House. This home is perfect for those who have never had a bat house before, or for seasoned landlords who wish to add to their existing bat colony. The 0.75" deep, single chamber accommodates up to 12 bats, and the rough interior with plastic screening offers several places for them to cling and rest. A 0.5" thick echolocation slot on the front of the item helps bats return to the roost, while the slight overhang of the roof protects the interior from rain. The solid eastern white pine construction creates a lasting and natural home, which will age to a lovely silver color with exposure to the elements. Use the attached metal hanger to mount this home to a pole, post, or building. Expand your bat sanctuary with this Mini Bat House. Made in the USA.